When reading for long periods of time, we know that weight matters. That’s why we worked hard to make our newest Kindle lighter than ever – only 8.7 ounces – so you can read comfortably for hours with just one hand. Kindle is lighter than a typical paperback, and thinner than a magazine. 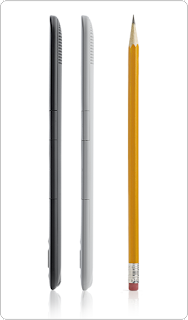 Just a third of an inch in profile, Kindle fits perfectly in your hands. Kindle is easy to hold and read. We designed it with long-form reading in mind. When reading for long periods of time, people naturally shift positions and often like to read with one hand. Kindle's page-turning buttons are located on both sides, allowing you to read and turn pages from any position. The new soft-touch, textured back is comfortable to hold and never gets hot in your hands. Unlike a laptop or tablet, Kindle never gets hot so you can read comfortably as long as you like. Unlike most electronic devices, we wanted to keep Kindle simple. Kindle is wireless and ready to use right out of the box – no setup, no software to install, no computer required. A single charge lasts up to one month with wireless off. Keep wireless always on and it lasts for up to ten days. Battery life will vary based on wireless usage, such as shopping the Kindle Store and downloading content. In low-coverage areas or in EDGE/GPRS-only coverage, wireless usage will consume battery power more quickly. Whispernet utilizes Amazon's optimized technology plus a high-speed data network to enable you to wirelessly search, discover, and download content on the go. Your books and periodicals are delivered via Whispernet in less than 60 seconds. Wireless download times can vary based on 3G or EDGE/GPRS coverage, signal strength, and file size. See wireless coverage map for availability. No monthly wireless bills or commitments. Amazon pays for Kindle's wireless connectivity so you won't see a monthly wireless bill. There is no wireless setup – you are ready to shop, purchase, and read right out of the box. See Wireless Terms and Conditions. Your Kindle may use wireless connectivity to make other services available, such as wireless delivery of personal documents, which may require an additional charge. For more information, see Wireless Terms and Conditions. Travel the globe and still get books in under 60 seconds. Kindle uses GSM technology—the most popular mobile wireless standard - with wireless coverage in over 100 countries and territories, such as Australia, Hong Kong, Germany, Japan, Norway, Spain, South Africa, the United Kingdom, and many others. Stay in touch with news from home by having your newspaper and magazine subscriptions delivered wirelessly while you travel. See wireless coverage map for availability. Kindle automatically detects nearby Wi-Fi networks at school, home, or your favorite café. At a hotel or café that requires a password? Simply enter the password and connect to the network. Once you have added a Wi-Fi network, Kindle will automatically connect to that network the next time you’re near the hotspot. Kindle does not currently connect to enterprise or peer-to-peer networks. Enjoy free Wi-Fi access at AT&T hotspots across the U.S. for shopping and downloading Kindle content — no AT&T registration, sign-in, or password required. The ultimate travel companion, Kindle weighs 8.7 ounces and holds up to 3,500 books. No longer pick and choose which books fit in your carry-on. You can always have your entire Kindle library with you. Delete with abandon. We automatically keep an archival copy of your Kindle books—re-download for free, anytime. We even back up your last page read and annotations, so when you re-download to the device you can pick up where you left off with all of your notes still in place. Organize your Kindle library into collections, or categories, to easily access any book you are looking for. You can add an item to multiple collections to make organizing and finding titles even easier. For example, you can add the same book to your "History" and "My Favorite Authors" collections. Available in both White and Graphite color options. You can find the All New Kindle 3G Wireless Reading Device at http://www.amazon.com/ and at select retailer's. 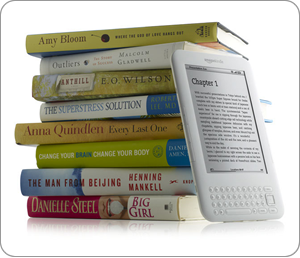 Experience the versatility of the All New Kindle 3G Wireless Reading Device! One Lucky Reader will receive the Kindle 3G (Graphite)! 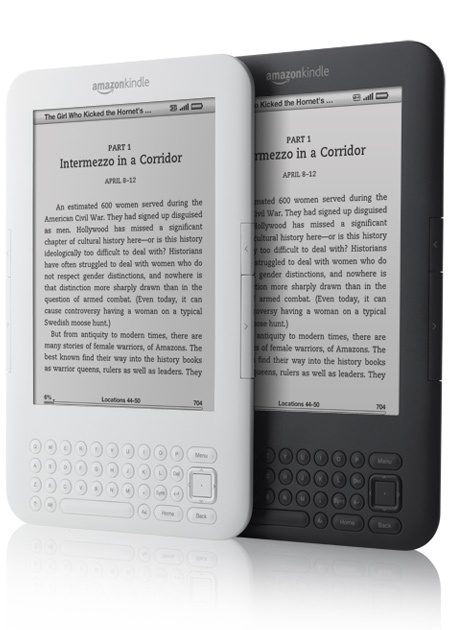 Leave a comment~Which of the new features in the New Kindle 3G are you most excited about? The comment is considered your entry. Entry to this giveaway ends at 12pm PST October 3, 2010. Winner's are chosen randomly through random.org. The winner will be announced in a post within 7 days of the giveaway ending, and contacted through email. The winner will have 48 hrs. to respond or another winner will be chosen. I like the slim design feature. I love how small and light it is! So tiny! I love it's new size and that it gets wifi. I have 2 favorite features. First, that it has no monthly charges and second, that it holds 3,500 books. I love to read. This would be so perfect for me. Since I hate to read having a Kindle would make me read a book since it's so lighweight and portable and all the books are right there in your hands. My arms are already tired from carrying around diaper bags for twins and a baby!! Thanks for the chance to enter. I'm really excited about the built in Wi-fi! I entered your Amazon gift card giveaway. The battery life is good for one month that's amazing. I love that you can organize your books into different collections. I am excited about New, Built-In Wi-Fi because now you can enter it where there is internet. I like the fact that it's smaller and lighter than the older version. Perfect for my husband when he travels out of town for work that way he doesn't have to carry around all his books. i like everything about the kindle... all book in one spot.. wifi... doesnt get hot... lighter... thinner! The feature I am most excited about is the new Wi-Fi. I love the global 3G coverage! Oh, very excited about this!!!! I am uber ecstatic about the 3G!!!! What a great thing! I love the worry free archive!